Anita O'Day: Revisiting A Classic Voice When jazz singer Anita O'Day died in 2006, the music world lost her unique sound. A biographical documentary, Anita O'Day: The Life of a Jazz Singer, is now out on DVD. 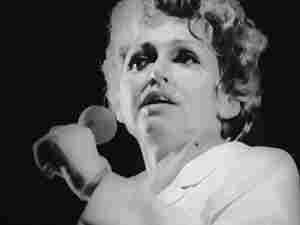 Jazz singer Anita O'Day died of a heart attack in 2006. She had possessed one of the music world's most distinctive voices, the product of a botched childhood tonsillectomy that left her without a uvula, and thus, without vibrato or the ability to sustain notes. As a result, her singing had a speechlike, conversational quality, with the timbre of an alto saxophone. In the late 1930s, O'Day joined drummer Gene Krupa's band in Chicago, recording the hit song "Let Me Off Uptown" that first brought her fame. Within a few years, she was in California, singing with Stan Kenton, but she bridled at his group's stricter approach to music and returned to Krupa before setting off on her own as a soloist. Her career reached its pinnacle in the 1950s, climaxing with a triumphant performance at the 1958 Newport Jazz Festival, before a gradual decline in the next decade, as she began to suffer health problems linked to her heroin abuse. After kicking her drug habit in 1967, O'Day returned to prominence, giving a strong showing at the 1970 Berlin Jazz Festival and starting her own record label. She continued performing well into her 70s. Anita O'Day: The Life of a Jazz Singer, a biographical documentary about the artist, is now out on DVD. This interview with Anita O'Day was originally broadcast in 1987.